After the relatively subdued and serious “The Boar,” Grace And Frankie kicks the comedy up a notch again in “The Anchor.” Outside minor characters bring in some weird humor, and even some of the more serious aspects of the episode—like Sol trying to work his way back into Robert’s life—finds some very funny moments. The main storylines of the season are still churning, and there are some significant character moments for both Grace and Frankie. There’s a little more action to “The Anchor” than to “The Boar,” and there’s a lot more humor. It comes to no surprise that a very funny episode of Grace And Frankie sees the return of Brianna. She hadn’t been away for very long, but any episode that doesn’t feature June Diane Raphael in some capacity can’t quite live up to the comedy potential of those that do. Frankie’s yam lube ventures continue in “The Anchor,” reaching a critical turning point. When Brianna sends Frankie the packaging samples, Frankie realizes the recipe for her lube has been altered. In order to extend its shelf life, it has palm oil in it, and Frankie won’t stand for that, so she goes toe-to-toe with Brianna, and while it doesn’t quite reach the hilarity of their first negotiation, there are some brilliant moments. Tomlin and Raphael just play so well against each other. Frankie at one point reminds Brianna that she peed her pants at her tenth birthday, and Brianna says, without missing a beat, that she had a medical condition. It’s pretty impressive how much mileage Grace And Frankie can get out of the simplest of comedic setups. There’s no good reason Frankie saying that she doesn’t know how to play chess in the first scene should be laugh-out-loud-funny, and yet it most assuredly is. Frankie’s crow imitations are hilarious too, but especially because Grace doesn’t even bat an eye at her antics, already far too accustomed to the loud, silly tangents that come with living with Frankie. Even just the fact that Brianna’s assistant Adam has friends who don’t believe Frankie exists is hilarious. 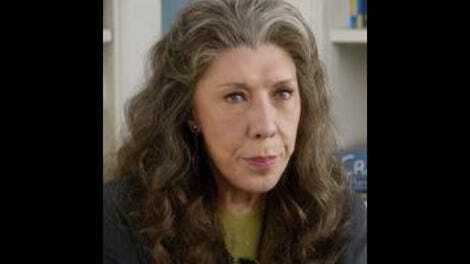 Overall, this season has brought in a lot more bit characters than the first did, fleshing out the world and Grace And Frankie with some genuine oddballs that provide unexpected laughs, like earlier in the season when the two women at the dress donation center conveyed that there was some drama that went into naming the place. There’s a similar moment like that here in “The Anchor,” when two of the businesspeople in Frankie and Brianna’s meeting argue over the term “shelf stories.” Moments like this seem more fitting for the kind of network sitcom that Grace And Frankie’s creators hail from, but they manage to not feel too out-of-place in the realm of this slightly more grounded show. Their quirks are specific and not too over-the-top, like Gretchen, the paranoid and unsubtle waitress. And the business meeting is full of funny but realistic dynamics and banter. Both Grace and Frankie have very clear and effective emotional arcs in the episode, too. Frankie begins the episode bursting with excitement—first, at the prospect that the package she receives contains cheese and then by the actual contents. But her light dwindles over the course of the episode as she realizes it’s not going to be easy to fight for what she wants. There’s some more solid Grace and Frankie bonding, with Grace imparting her sage business advice on Frankie. But Frankie’s still Frankie, and she ends up doing things her own way, which backfires, leaving her with nothing. It’s genuinely devastating when she sadly remarks that the yam lube was one of the coolest things she ever created. Grace sympathizes, and again, their relationship takes center-stage. For all the comedy that came from her over-the-top attempts to make her point, Frankie ends up facing real, believable consequences for her actions. Grace, too, goes through a transformation in the episode. Jane Fonda gives another fantastic dramatic performance with touches of comedy. (I also laughed at loud when she shouts “Phil!” at the start of her date.) She’s full of nervous energy in the beginning, brought on by Phil reaching out to ask her to lunch. When she gives Frankie the details of why the restaurant The Anchor is significant, it’s a really well written scene. Frankie’s hoping for some drama and romance—an illicit kiss perhaps. But in reality, the story is much more understated, more about how Grace and Phil felt in the moment rather than what they did. It’s a highly realistic rendering of how the simplest, most uneventful moments can sometimes be the most emotionally significant ones. Even Frankie admits at the end that the story indeed got better, realizing how much it means to Grace. Grace’s anxiety about the date allows Frankie to reinforce just how much these two women have come to love each other. Grace worries that she’s unlovable, and Frankie shuts her the hell up: “You’re not unlovable. I love you. You happy?” There’s that feel-good aura that Grace And Frankie wears so well. In some ways, the feel-good outlook Grace And Frankie has does take some of the suspense out of Robert and Sol’s storyline. The two seem destined to mend fences and get their marriage back on track. I highly doubt the show will go too dark with their storyline. But despite the lack of stakes, I did enjoy Sol’s attempts to win Robert back in this episode. Sol’s sleepover with his sons is just purely adorable, and the long-winded messages he leaves on Robert’s answering machine are downright hilarious, somehow touching on moon charts, a young Mickey Rourke, and the true meaning of “hakuna matata.” Sol’s earnest personality comes through, and it’s a fun take on the desperate, rambly post-breakup speech/email/voicemail. 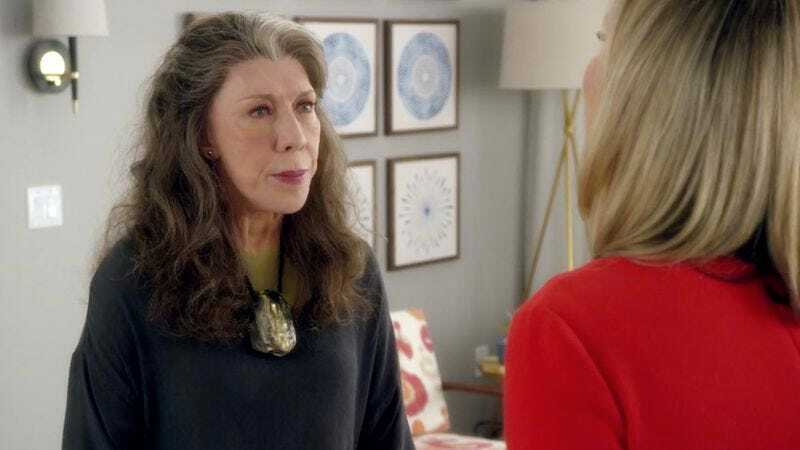 It turns out Grace And Frankie is still acutely in touch with the realities and complications of dating and relationships, seen in both Grace and Phil and Robert and Sol’s storylines this episode. Frankie has a one-woman show about parabens called Para-been To Hell And Back, which she has performed for Grace twice. Two times. Grace does look absolutely fabulous for her date.